In between the author’s federal party volunteer work, getting taxes complete, paying employment, and shooting hobbies, as well as family on top of that; TPF is pleased to be able to take a look at SOG’s Flash II, assisted opening knife. The model we are looking at today is the black polymer handled, drop-point, straight-edged version; specifically the FSA-8. Back to the SOG Flash II. The knife uses the patented SAT opening mechanism (SOG Assisted Technology) for its mechanism for completing the opening once the thumb stud on the blade is engaged. It is fast and solid in operation. 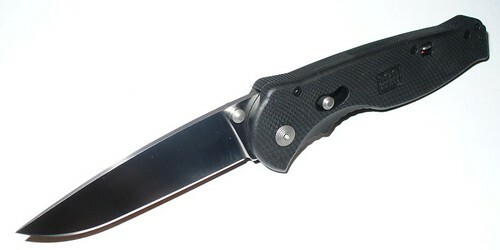 The model reviewed was equipped with black Zytel handles and includes a reversible pocket clip. This clip actually protrudes past the handle and allows for the knife to be carried in one’s pocket with the most minimal visual clues. 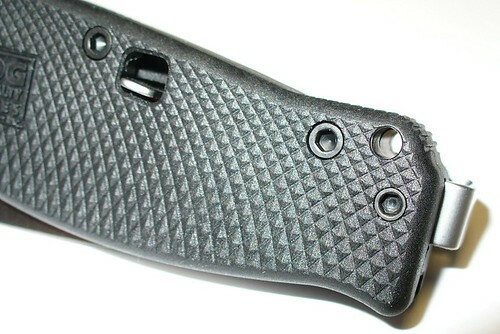 As SOG states, the clip allows for “the lowest, most discreet carry possible.” TPF has to agree, and the clip is mounted to allow for minimal hand repositioning or manipulation, when withdrawing it from the pocket and opening the blade. Now for the operation of the Flash II. Opening the blade is a two-part process. Firstly the safety must be manipulated into the unlocked position, which is denoted by a bright red indicator. This safety appears to have a detent as it does require a decent amount of effort to shift and there is a noticeable mechanical “unlock/lock” when used. The safety was included as an additional measure to prevent unwanted blade opening, which sounds like a CYA statement to TPF. The opening of the blade is accomplished only through the use of the blade mounted thumb studs mounted on opposite side of the blade itself. For closing of the blade, the pivoting stud located in the handles is pulled back and unlocks the blade, allowing for closing. This pivoting stud is easy to use and allows for one-handed closing by using the thumb to unlock the blade and then pressing the back of the blade against any object, such as a pant leg, and into the closed position. Both the safety lock and the blade release are located on the same side of the knife, the only true issue with the knife is if you reverse put the pocket clip. Manipulation of the safety looks as though it would become much more difficult due to how close the clip sits to the safety lever. The 89mm (3.5″) stainless steel, straight blade is housed in the encompassing and surprisingly comfortable and firm grips. At 97 grams (3.1 oz) this knife masses very light for its size due to the thorough use of Zytel. SOG Specialty Knives and Tools has numerous variations available for this knife including tanto shaped blades, black TiNi coatings, partially serrated edges and numerous colour options for the handle similar to the SOGZilla reviewed earlier by TPF. Also available is an aluminum machined handle version which increases the Flash II’s mass to 131 grams (4.2 oz), and a rescue version which has a serrated sheep’s foot contoured blade with a black or orange Zytel handle. The SOG Flash II reviewed (FSA-8) has a MSRP of $75.00 USD and is available at a great variety of knife stores across Canada. SOG’s website can help prospective buyers to decide on the option they like best and even purchase it direct, but be aware that shipping costs may be unbelievably high. Most versions of the Flash II have MSRP’s under $90 with the exception of a few select configurations which top out at nearly $145.00 USD. SOG Specialty Knives and Tools’ Flash II – Tactical, Practical, or Fantastical? This entry was posted on April 26, 2011 by M. Duynhoven. It was filed under Blades and tools and was tagged with Flash II, knife, SAO, SOG.